Wedding Design Studio is pleased to announce that we will be partnering with the Thrive Alive Foundation by donating decor for their first annual gala! 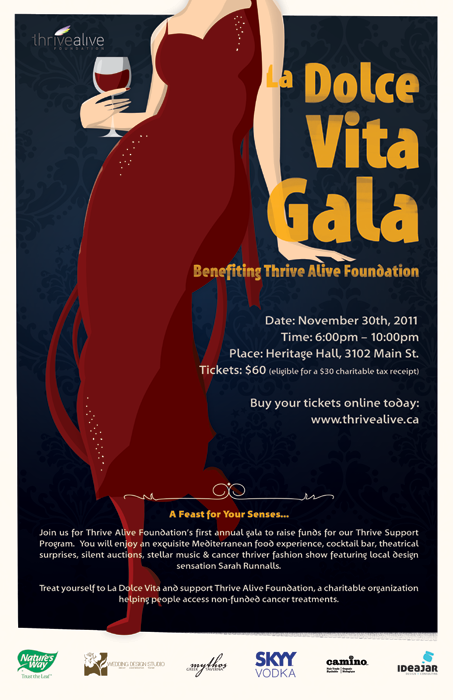 This gala will raise much needed funds for cancer patients who cannot afford proper treatment. Thrive Alive Foundation is a charitable organization committed to providing resources and assistance to people in need for their cancer treatments not covered by government or healthcare plans. Totally unique in Canada, they are not part of any specific centre, agency or clinic, giving them the flexibility to support patient treatment anywhere in Canada. All funds raised from La Dolce Vita Gala will go directly towards launching our Thrive Support Program on January 1st and helping people in need. Stephanie Klaus is the Co-Founder and Board Chair of Thrive Alive Foundation. She is also one of our 2012 brides!! Please join with Stephanie and Thrive Alive Foundation by attending this wonderful fundraising event! We hope to see you there!